Philips is bringing the magic of Disney to your child’s bedroom through light, in its latest innovative range of LED lighting featuring iconic Disney characters. Moms know how active their children’s imaginations are and how important it is to create a nurturing environment that helps them feel safe and comforted while nourishing their minds. That’s why Philips and Disney have come together to develop a range of inspiring, magical and safe lighting products for children, parents and everybody young-at-heart. Powered by Philips’ advanced LED technology and designed with children in mind, the range of Philips Disney lighting products fill the day-to-night transition with magic and wonder. Through light, memories are made and you can bond with your children, making their bedroom a more imaginative place for them to learn, play, sleep and grow. Story time is one of the most important moments in the day for parents to connect with their kids, so making this time count is everything. 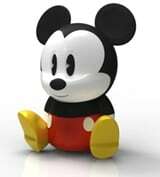 Philips Disney StoryLight Mickey makes reading together more magical than ever. This innovative Mickey Mouse shaped light cleverly synchronizes colored light with classic Disney stories read through an interactive e-book on an iPad. As you read with your child, all the colors of the rainbow light up the world of their story, bringing it to life through light and filling their bedroom with wonder and magic as you read their favorite bedtime story. With over 16 million colors to choose from, using this Friend of Hue*, you can create a different mood every time you read their favorites, time and time again. The 120 lumen bulbs emit soft diffused LED light that isn’t too bright, so you can ensure your little ones feel comforted and relaxed just before bed. Philips understands that teaching your child to stick to a bedtime routine can be tricky at the best of times. So to help take the hassle out of bed time Philips has created the Philips Disney SleepTime Mickey and SleepTime Minnie table lamps to add a little Disney magic to your child’s bedtime routine. Using the iconic Disney characters, the Mickey Sleeptime and Minnie Sleeptime table lamps use Philips LED technology to soothe your child to sleep before waking them up gently, while using easy to recognize sun and moon indicators to separate sleep and play time. The table lamps are also perfect for reading bedtime stories, creating a comforting environment for children to sleep in. Every child experiences bad dreams, now you can scare away your little ones’ bad dreams and get your nights back with the Philips Disney LED SoftPals range. With the Philips LED SoftPals range you can set bedtime rituals and be assured that your child won’t get scared in the night if they wake up. The perfect night time friends, the Philips LED SoftPals, in the form of classic Minnie and Mickey, and Monster’s Inc. stars Sulley and Mike characters will help even the most nervous of children feel safe at night. The easy-to-use night light casts a comforting glow so they dont feel lonely when they go to sleep or wake up from a bad dream. Philips also knows that kids love to create make believe in their bedrooms, whether it’s reading stories or bringing their toys to life to create their own magical worlds and making an environment where their imaginations can flourish is important for their development. 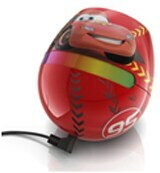 The new micro Philips Disney LivingColors Cars, Planes, Ariel and Princess editions are fun to use and child-friendly lamps that will help paint your child’s room with color and inspire their imagination. Using Philips LED technology, the Philips LivingColor Micro lamps can alternate between 64 colors and create different tones with diffused light and colors. In two vibrant designs, the Philips LivingColor Micro lamps come in popular Disney Pixar Cars, Planes, Ariel or Disney Princess editions. Each come with easy to use on-product control that’s so simple that even small children will find the lamps easy to use. Featuring two of Disney’s most iconic and recognizable characters, Mickey and Minnie, the new Philips Disney LivingColors Mini Mickey & Minnie Mouse will instantly brighten up any room. From a fun play area to a child’s bedroom, the lamps create a fun or soothing ambience. There are 256 light colors to choose from, so you can a pick a color to suit almost any mood whether you want to relax with a movie, soothe a child to sleep or simply create a fun atmosphere for entertaining friends and family. Philips knows that your child’s room is a fortress where they build dens and play make-believe. 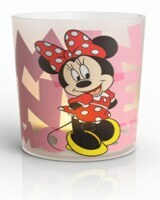 Now you can enhance their play space and imagination with the Philips Disney LED candles. Powered with Philips’ advanced LED technology, the LED candle lights omit a warm glow that emulates the softness and flicker of real candle flames. Whether your child is a Disney Princess in the making or in love with all things Minnie and Mickey, the relaxing diffused light will add a hint of magic to play time. Simply tilt the candles to turn them on and off; they are so easy to use little ones can easily create an enchanted atmosphere in their own room. The Philips LED candle lights are a softer alternative to a bedside lamp and safer alternative to candles, meaning no hot bulbs or open flames where little hands are likely to reach. At Philips we know that light can help enhance your mood, help you wake better, concentrate better, and simply feel happier. Now, you can give the gift of light to the most precious people in your world – your kids. The new Philips Disney lighting range inspires magical family moments and provides comfort to kids through Disney characters they know and love. Whether it’s helping little ones’ sleeping and waking rituals, making playtime as vivid as their imagination, or making story time more enchanted and absorbing, there is a Philips Disney friend for every moment or stage of their day – and childhood. *A Friend of Hue connects seamlessly with Philips Hue, the smartest home connectivity LED lighting system. The lamps can be operated through a smart device, providing new applications in home lighting..